The Intermediate-Range Nuclear Forces Treaty (INF Treaty, formally Treaty Between the United States of America and the Union of Soviet Socialist Republics on the Elimination of Their Intermediate-Range and Shorter-Range Missiles; Russian: Договор о ликвидации ракет средней и меньшей дальности / ДРСМД, Dogovor o likvidatsiy raket sredney i menshey dalnosti / DRSMD) was an arms control treaty between the United States and the Soviet Union (and its successor state, the Russian Federation). U.S. President Ronald Reagan and Soviet General Secretary Mikhail Gorbachev signed the treaty on 8 December 1987. The United States Senate approved the treaty on 27 May 1988, and Reagan and Gorbachev ratified it on 1 June 1988. Mikhail Gorbachev and Ronald Reagan sign the INF Treaty. 8 December 1987, 1:45 p.m. The INF Treaty eliminated all of the two nations' land-based ballistic missiles, cruise missiles, and missile launchers with ranges of 500–1,000 kilometers (310–620 mi) (short medium-range) and 1,000–5,500 km (620–3,420 mi) (intermediate-range). The treaty did not apply to air- or sea-launched missiles. By May 1991, the nations had eliminated 2,692 missiles, followed by 10 years of on-site verification inspections. President Donald Trump announced on 20 October 2018 that he was withdrawing the U.S. from the treaty, accusing Russia of non-compliance. The U.S. formally suspended the treaty on 1 February 2019, and Russia did so on the following day in response to the U.S. withdrawal. In March 1976, the Soviet Union first deployed the RSD-10 Pioneer (called SS-20 Saber in the West) in its European territories, a mobile, concealable intermediate-range ballistic missile (IRBM) with a multiple independently targetable reentry vehicle (MIRV) containing three nuclear 150-kiloton warheads. 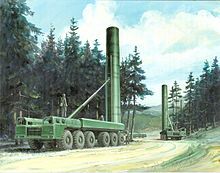 The SS-20's range of 4,700–5,000 kilometers (2,900–3,100 mi) was great enough to reach Western Europe from well within Soviet territory; the range was just below the SALT II minimum range for an intercontinental ballistic missile, 5,500 km (3,400 mi). The SS-20 replaced aging Soviet systems of the SS-4 Sandal and SS-5 Skean, which were seen to pose a limited threat to Western Europe due to their poor accuracy, limited payload (one warhead), lengthy preparation time, difficulty in being concealed, and immobility (thus exposing them to pre-emptive NATO strikes ahead of a planned attack). Whereas the SS-4 and SS-5 were seen as defensive weapons, the SS-20 was seen as a potential offensive system. The US, then under President Jimmy Carter, initially considered its strategic nuclear weapons and nuclear-capable aircraft to be adequate counters to the SS-20 and a sufficient deterrent against possible Soviet aggression. In 1977, however, Chancellor Helmut Schmidt of West Germany argued in a speech that a Western response to the SS-20 deployment should be explored, a call which was echoed by NATO, given a perceived Western disadvantage in European nuclear forces. Leslie H. Gelb, the US Assistant Secretary of State, later recounted that Schmidt's speech pressured the US into developing a response. On 12 December 1979, following European pressure for a response to the SS-20, Western foreign and defense ministers meeting in Brussels made the NATO Double-Track Decision. The ministers argued that the Warsaw Pact had "developed a large and growing capability in nuclear systems that directly threaten Western Europe": "theater" nuclear systems (i.e., tactical nuclear weapons). In describing this "aggravated" situation, the ministers made direct reference to the SS-20 featuring "significant improvements over previous systems in providing greater accuracy, more mobility, and greater range, as well as having multiple warheads". The ministers also attributed the altered situation to the deployment of the Soviet Tupolev Tu-22M strategic bomber, which they believed to display "much greater performance" than its predecessors. Furthermore, the ministers expressed concern that the Soviet Union had gained an advantage over NATO in "Long-Range Theater Nuclear Forces" (LRTNF), and also significantly increased short-range theater nuclear capacity. To address these developments, the ministers adopted two policy "tracks". One thousand theater nuclear warheads, out of 7,400 such warheads, would be removed from Europe and the US would pursue bilateral negotiations with the Soviet Union intended to limit theater nuclear forces. Should these negotiations fail, NATO would modernize its own LRTNF, or intermediate-range nuclear forces (INF), by replacing US Pershing 1a missiles with 108 Pershing II launchers in West Germany and deploying 464 BGM-109G Ground Launched Cruise Missiles (GLCMs) to Belgium, Italy, the Netherlands, and the United Kingdom beginning in December 1983. The Soviet Union and United States agreed to open negotiations and preliminary discussions, named the Preliminary Intermediate-Range Nuclear Forces Talks, which began in Geneva in October 1980. On 20 January 1981, Ronald Reagan was sworn into office as President after defeating Jimmy Carter in an election. Formal talks began on 30 November 1981, with the US then led by Ronald Reagan and the Soviet Union by Leonid Brezhnev. The core of the US negotiating position reflected the principles put forth under Carter: any limits placed on US INF capabilities, both in terms of "ceilings" and "rights", must be reciprocated with limits on Soviet systems. Additionally, the US insisted that a sufficient verification regime be in place. Paul Nitze, a longtime hand at defense policy who had participated in the Strategic Arms Limitation Talks (SALT), led the US delegation after being recruited by Secretary of State Alexander Haig. Though Nitze had backed the first SALT treaty, he opposed SALT II and had resigned from the US delegation during its negotiation. Nitze was also then a member of the Committee on the Present Danger, a firmly anti-Soviet group composed of neoconservatives and conservative Republicans. Yuli Kvitsinsky, the well-respected second-ranking official at the Soviet embassy in West Germany, headed the Soviet delegation. On 18 November 1981, shortly before the beginning of formal talks, Reagan made the Zero Option proposal (or the "zero-zero" proposal). The plan called for a hold on US deployment of GLCM and Pershing II systems, reciprocated by Soviet elimination of its SS-4, SS-5, and SS-20 missiles. There appeared to be little chance of the Zero Option being adopted, but the gesture was well received in the European public. In February 1982, US negotiators put forth a draft treaty containing the Zero Option and a global prohibition on intermediate- and short-range missiles, with compliance ensured via a stringent, though unspecific, verification program. Opinion within the Reagan administration on the Zero Option was mixed. Richard Perle, then the Assistant Secretary of Defense for Global Strategic Affairs, was the architect of the plan. Secretary of Defense Caspar Weinberger, who supported a continued US nuclear presence in Europe, was skeptical of the plan, though eventually accepted it for its value in putting the Soviet Union "on the defensive in the European propaganda war". Reagan later recounted that the "zero option sprang out of the realities of nuclear politics in Western Europe". The Soviet Union rejected the plan shortly after the US tabled it in February 1982, arguing that both the US and Soviet Union should be able to retain intermediate-range missiles in Europe. Specifically, Soviet negotiators proposed that the number of INF missiles and aircraft deployed in Europe by one side be capped at 600 by 1985 and 300 by 1990. Concerned that this proposal would force the US to withdraw aircraft from Europe and not deploy INF missiles, given US cooperation with existing British and French deployments, the US proposed "equal rights and limits"—the US would be permitted to match Soviet SS-20 deployments. Between 1981 and 1983, US and Soviet negotiators gathered for six rounds of talks, each two months in length—a system based on the earlier SALT talks. The US delegation was composed of Nitze, General William F. Burns of the Joint Chiefs of Staff, Thomas Graham of the Arms Control and Disarmament Agency (ACDA), and officials from the US Department of State, Office of the Secretary of Defense, and US National Security Council. Colonel Norman Clyne, a SALT participant, served as Nitze's chief of staff. There was little convergence between the two sides over these two years. A U.S. effort to separate the question of nuclear-capable aircraft from that of intermediate-range missiles successfully focused attention on the latter, but little clear progress on the subject was made. In the summer of 1982, Nitze and Kvitsinsky took a "walk in the woods" in the Jura Mountains, away from formal negotiations in Geneva, in an independent attempt to bypass bureaucratic procedures and break the negotiating deadlock. Nitze later said that his and Kvitsinsky's goal was to agree to certain concessions that would allow for a summit meeting between Brezhnev and Reagan later in 1982. Nitze's offer to Kvitsinsky was that the US would forego deployment of the Pershing II and continue deployment of GLCMs, but limited to 75 missile launchers. The Soviet Union, in return, would also have to limit itself to 75 intermediate-range missile launchers in Europe and 90 in Asia. Due to each GLCM launcher containing four GLCMs and each SS-20 launcher containing three warheads, such an agreement would have resulted in the US having 75 more intermediate-range warheads in Europe than the Soviet Union, though SS-20s were seen as more advanced and maneuverable than GLCMs. While Kvitsinsky was skeptical that the plan would be well received in Moscow, Nitze was optimistic about its chances in Washington. The deal ultimately found little traction in either capital. In the US, the Office of the Secretary of Defense opposed Nitze's proposal, as it opposed any proposal that would allow the Soviet Union to deploy missiles to Europe while blocking US deployments. Nitze's proposal was relayed by Kvitsinsky to Moscow, where it was also rejected. The plan accordingly was never introduced into formal negotiations. Thomas Graham, a US negotiator, later recalled that Nitze's "walk in the woods" proposal was primarily of Nitze's own design and known beforehand only to William F. Burns, another arms control negotiator and representative of the Joint Chiefs of Staff (JCS), and Eugene V. Rostow, the director of the Arms Control and Disarmament Agency. In a National Security Council following the Nitze-Kvitsinsky walk, the proposal was received positively by the JCS and Reagan. Following protests by Richard Perle, working within the Office of the Secretary of Defense, Reagan informed Nitze that he would not back the plan. The State Department, then led by Alexander Haig, also indicated that it would not support Nitze's plan and preferred a return to the Zero Option proposal. Nitze argued that one positive consequence of the walk in the woods was that the European public, which had doubted US interest in arms control, became convinced that the US was participating in the INF negotiations in good faith. In early 1983, US negotiators indicated that they would support a plan beyond the Zero Option if the plan established equal rights and limits for the US and Soviet Union, with such limits valid worldwide, and excluded British and French missile systems (as well as those of any other third party). As a temporary measure, the US negotiators also proposed a cap of 450 deployed INF warheads around the world for both the US and Soviet Union. In response, Soviet negotiators expressed that a plan would have to block all US INF deployments in Europe, cover both missiles and aircraft, include third parties, and focus primarily on Europe for it to gain Soviet backing. In the fall of 1983, just ahead of the scheduled deployment of US Pershing IIs and GLCMs, the US lowered its proposed limit on global INF deployments to 420 missiles, while the Soviet Union proposed "equal reductions": if the US cancelled the planned deployment of Pershing II and GLCM systems, the Soviet Union would reduce its own INF deployment by 572 warheads. In November 1983, after the first Pershing IIs arrived in West Germany, the Soviet Union walked out of negotiations, as it had warned it would do should the US missile deployments occur. Reagan and Gorbachev shake hands after signing the INF Treaty ratification during the Moscow Summit on 1 June 1988. British Prime Minister Margaret Thatcher played a key role in brokering the negotiations between Reagan and Gorbachev in 1986–1987. In March 1986, negotiations between the US and the Soviet Union resumed, covering not only the INF issue, but also separate discussions on strategic weapons (START I) and space issues (Nuclear and Space Talks). In late 1985, both sides were moving towards limiting INF systems in Europe and Asia. On 15 January 1986, Gorbachev announced a Soviet proposal for a ban on all nuclear weapons by 2000, which included INF missiles in Europe. This was dismissed by the US and countered with a phased reduction of INF launchers in Europe and Asia to none by 1989. There would be no constraints on British and French nuclear forces. A series of meetings in August and September 1986 culminated in the Reykjavík Summit between Reagan and Gorbachev on 11 October 1986. Both agreed in principle to remove INF systems from Europe and to equal global limits of 100 INF missile warheads. Gorbachev also proposed deeper and more fundamental changes in the strategic relationship. More detailed negotiations extended throughout 1987, aided by the decision of West German Chancellor Helmut Kohl in August to unilaterally remove the joint US-West German Pershing 1a systems. Initially, Kohl had opposed the total elimination of the Pershing Missiles, claiming that such a move would increase his nation's vulnerability to an attack by Warsaw Pact Forces. The treaty text was finally agreed in September 1987. On 8 December 1987, the Treaty was officially signed by President Reagan and General Secretary Gorbachev at a summit in Washington and ratified the following May in a 93-5 vote by the United States Senate. The treaty prohibits both parties from possessing, producing or flight-testing ground-launched ballistic and cruise missiles with ranges of 500-5,500km. Possessing or producing ground-based launchers of those missiles is also prohibited. The ban extends to weapons with both nuclear and conventional warheads, but does not cover air-delivered or sea-based missiles. Existing weapons had to be destroyed, and a protocol for mutual inspection was agreed upon. Each party has the right to withdraw from the treaty with six months' notice, "if it decides that extraordinary events related to the subject matter of this Treaty have jeopardized its supreme interests". A Soviet inspector examines a BGM-109G Gryphon ground-launched cruise missile in 1988 prior to its destruction. Accompanied by their NATO counterparts, Soviet inspectors enter a nuclear weapons storage area in Greenham, UK, 1989. Ambassador Eileen Malloy, chief of the arms control unit at the U.S. Embassy in Moscow at the destruction site in Saryozek in early 1990. By the treaty's deadline of 1 June 1991, a total of 2,692 of such weapons had been destroyed, 846 by the US and 1,846 by the Soviet Union. As provided by the treaty, onsite inspections ended in 2001. After that time, compliance was checked primarily by satellites. After the dissolution of the Soviet Union in December 1991, the United States considered twelve of the post-Soviet states to be inheritors of the treaty obligations (the three Baltic states are considered to preexist their annexation by the USSR). Of the six having inspectable INF facilities on their territories, Belarus, Kazakhstan, the Russian Federation, and Ukraine became active participants in the treaty process, while Turkmenistan and Uzbekistan, having less significant INF sites, assumed a less active role. In February 2008, the Russian president Vladimir Putin gave a speech at the Munich Security Conference in which he said the INF Treaty should be revisited to ensure security, as it only restricted Russia and the U.S. but not other countries. Dan Blumenthal of the American Enterprise Institute wrote that the actual Russian problem with the INF was that China is not bound by it and continued to build up their own intermediate-range forces. In 2007, Chief of the General Staff of the Armed Forces of the Russian Federation Yuri Baluyevsky said that Russia was planning to unilaterally withdraw from the treaty in response to deployment of adaptable defensive NATO missile system and because other countries were not bound to the treaty. According to US officials, Russia violated the treaty by testing the SSC-8 cruise missile in 2008. The US representatives briefed NATO on a Russian nuclear treaty breach again in 2014 and 2017. In 2013, reports came out that Russia had tested and planned to continue testing two missiles in ways that could violate the terms of the treaty: the SS-25 road mobile intercontinental ballistic missile and the newer RS-26 ICBM, although neither missile is considered intermediate range. Russian officials argued that the American decision to deploy the missile defense system in Europe was a violation of the treaty. Russian experts also stated that the US usage of target missiles and unmanned aerial vehicles, such as the MQ-9 Reaper and MQ-4, violated the INF Treaty. The Western press has been dismissive of Russian claims that U.S. missile defense in Eastern Europe, ostensibly meant to intercept missiles from Iran, presents a formidable offensive force near Russian borders. The Bulletin of the Atomic Scientists published a report in February 2019, using publicly available documents, on how the Aegis-based missile defense installations in Poland and Romania are not capable of providing missile defense against Iran due to the limited range of the Aegis radar, but retain offensive capabilities that are in violation of the INF. In 2013, the United States launched test launches from the ground of the AGM-158B aviation cruise missile with a range of a thousand kilometers and in December 2017, President Trump signed a bill on defense, which, among others, provided for the allocation of $ 25 million to develop a new cruise missile of this type. According to Russian diplomats this was a violation of the INF Treaty. The United States declared its intention to withdraw from the treaty on 20 October 2018. Donald Trump mentioned at a campaign rally that the reason for the pullout was because "they've [Russia has] been violating it for many years". This prompted Putin to state that Russia would not launch first in a nuclear conflict but would "annihilate" any adversary, essentially re-stating the policy of "Mutually Assured Destruction". Putin claimed Russians killed in such a conflict "will go to heaven as martyrs". It was also reported that the United States' need to counter a Chinese arms buildup in the Pacific was another reason for their move to withdraw, because China is not a signatory to the treaty. US officials extending back to the Obama period have noted this. For example, Kelly Magsamen, who helped craft the Pentagon's Asian policy under the Obama administration, said China's ability to work outside of the INF treaty had vexed policymakers in Washington, long before Trump came into office. A Politico article noted the different responses U.S. officials gave to this issue: "either find ways to bring China into the treaty or develop new American weapons to counter it" or "negotiating a new treaty with that country". Bringing an ascendant China into the treaty, or into a new comprehensive treaty including other nuclear powers, was further complicated by relationships between China, India and Pakistan. The Chinese Foreign Ministry said a unilateral U.S. withdrawal would have a negative impact and urged the United States to "think thrice before acting". John R. Bolton, US National Security Advisor, said on Echo of Moscow that recent Chinese statements indicate that it wants Washington to stay in the treaty, while China itself is not bound in a treaty. On 26 October 2018, Russia called but lost a vote to get the U.N. General Assembly to consider calling on Washington and Moscow to preserve and strengthen the treaty. Russia had proposed a draft resolution in the 193-member General Assembly's disarmament committee, but missed the 18 October submission deadline so it instead called for a vote on whether the committee should be allowed to consider the draft. On the same day, John R. Bolton said in an interview with Reuters that the INF Treaty was a cold war relic and he wanted to hold strategic talks with Russia about Chinese missile capabilities. Four days later, NATO Secretary General Jens Stoltenberg called on Russia to comply with the treaty at a news conference in Norway saying "The problem is the deployment of new Russian missiles". Russian president Vladimir Putin announced on 20 November 2018 that the Kremlin was prepared to discuss INF with Washington but would "retaliate" if the United States withdrew. Starting on 4 December 2018, the United States said Russia had 60 days to comply with the treaty. On 5 December 2018, Russia responded by revealing their Peresvet combat laser, stating they had been deployed to Russia armed forces as early as 2017 "as part of the state procurement program". Russia presented the 9M729 (SSC-8) missile and its technical parameters to foreign military attachés at a military briefing on 23 January 2019, held in what it said was an exercise in transparency it hoped would persuade Washington to stay in the treaty. The Russian Defence Ministry said diplomats from the United States, Britain, France and Germany had been invited to attend the static display of the missile, but they declined to attend. The United States had previously rejected a Russian offer to do so because it said such an exercise would not allow it to verify the true range of its warheads. The summit between U.S. and Russia on 30 January 2019 failed to find a way to preserve the treaty. The United States suspended its compliance with the INF Treaty on 2 February 2019 following an announcement by U.S. Secretary of State Mike Pompeo the day prior. In addition the US said there was a six-month timeline for full withdrawal and INF Treaty termination if the Russian Federation did not come back into compliance within those six months given. The same day, Russian President Vladimir Putin announced that Russia had also suspended the INF Treaty in a 'mirror response' to President Donald Trump's decision to suspend the treaty, effective that day. The next day, Russia started work on new intermediate range (ballistic) hypersonic missiles along with land based (club kalibr - biryuza) systems (both nuclear armed) in response to the USA announcing it would start to conduct research and development of weapons prohibited under the treaty. On March 8, 2019, the foreign ministry of Ukraine announced that since the United States and Russian Federation have both pulled out of the INF treaty, it now has the right to develop intermediate-range missiles, citing Russian aggression as a serious threat to the European continent, and the presence of Russian Iskander-M nuclear-capable missile systems in Crimea. Ukraine had about forty percent of Soviet space industry, but never developed a missile with the range to strike Moscow (only having both longer and shorter-ranged missiles). Ukrainian president Petro Poroshenko said "We need high-precision missiles and we are not going to repeat the mistakes of the Budapest Memorandum". Ukraine remains a party to the Nuclear Non-Proliferation Treaty. Numerous prominent nuclear arms control experts, including George Shultz, Richard Lugar and Sam Nunn, urged Trump to preserve the treaty. Mikhail Gorbachev commented that Trump's nuclear treaty withdrawal is "not the work of a great mind" and that "a new arms race has been announced". The decision was criticized by chairmen of the United States House of Representatives Committees on Foreign Affairs and Armed Services who said that instead of crafting a plan to hold Russia accountable and pressure it into compliance, the Trump administration has offered Putin an easy way out of the treaty and has played right into his hands. Similar arguments were brought previously, on 25 October 2018 by European members of NATO who urged the United States "to try to bring Russia back into compliance with the treaty rather than quit it, seeking to avoid a split in the alliance that Moscow could exploit". Stoltenberg has suggested the INF Treaty could be expanded to include countries such as China and India, whose non-inclusion, Stoltenberg said, Russia had previously admonished. According to military analyst Pavel Felgenhauer, the US and NATO currently do not have a significant number of ballistic high-precision medium-range missiles, and it will take at least five years for them to create such missiles. Therefore, the withdrawal from the treaty will provide Russia with a total nuclear superiority, and this superiority should be enough to guarantee the West from any interference if Russia decides to take over any former Soviet republics. On 15 February 2019, Tulsi Gabbard introduced the proposed INF Treaty Compliance Act (H.R. 1249), designed to stop the United States from withdrawing from the treaty. ^ a b "Intermediate-Range Nuclear Forces Treaty (INF Treaty)". U.S. Department of State. Retrieved 2019-02-08. ^ AP Archive. "Reagan And Gorbachev Meet, Reagan And Gorbachev Sign Ratification Instruments For INF Treaty" – via YouTube. ^ "INF Treaty". United States Department of State. Retrieved 4 October 2018. ^ Kramer, Andrew E.; Specia, Megan (1 February 2019). "What Is the I.N.F. Treaty and Why Does It Matter?" – via NYTimes.com. ^ Stockholm International Peace Research Institute (2007). SIPRI Yearbook 2007: Armaments, Disarmament, and International Security. New York: Oxford University Press. p. 683. ISBN 978-0-19-923021-1. ^ Pengelly, Martin (20 October 2018). "Trump says US will withdraw from nuclear arms treaty with Russia". The Guardian. Retrieved 20 October 2018. ^ "Pompeo announces suspension of nuclear arms treaty". CNN. Retrieved 1 February 2019. ^ a b "Russia suspends INF treaty in 'mirror response' to US – Putin". Russia Today. 2 February 2019. Retrieved 2 February 2019. ^ Cant, James (May 1998). "The development of the SS-20" (PDF). Glasgow Thesis Service. Retrieved 9 January 2019. ^ "RSD-10 MOD 1/-MOD 2 (SS-20)". Missile Threat. 17 October 2012. Archived from the original on 28 August 2016. Retrieved 15 August 2016. ^ a b c "Intermediate-Range Nuclear Forces [INF] Chronology". Federation of American Scientists. Retrieved 15 August 2016. ^ a b c Bohlen et al. 2012, p. 7. ^ Bohlen et al. 2012, pp. 6–7. ^ a b c d e f "Paul Nitze and A Walk in the Woods – A Failed Attempt at Arms Control". Association for Diplomatic Studies and Training. 30 March 2016. Retrieved 19 August 2016. ^ a b "Interview with Leslie H. Gelb". National Security Archive. 28 February 1999. Retrieved 19 August 2016. ^ Legge 1983, p. 1. ^ "Soviet Long Range Theater Nuclear Forces" (PDF). CIA.gov. 6 April 1978. Retrieved February 8, 2019. ^ "Special Meeting of Foreign and Defence Ministers (The "Double-Track" Decision on Theatre Nuclear Forces)". NATO. 12 December 1979. Archived from the original on 27 February 2009. Retrieved 15 August 2016. ^ Legge 1983, pp. 1–2, 35–37. ^ Bohlen et al. 2012, pp. 8–9. ^ Bohlen et al. 2012, pp. 6, 9. ^ Burr, William; Wampler, Robert (27 October 2004). ""The Master of the Game": Paul H. Nitze and U.S. Cold War Strategy from Truman to Reagan". National Security Archive. Retrieved 19 August 2016. ^ a b c d Bohlen et al. 2012, p. 9. ^ "Yuli A. Kvitsinsky: Chief Soviet arms control negotiator". United Press International. 25 September 1981. Retrieved 19 August 2016. ^ Freudenheim, Milt; Slavin, Barbara (6 December 1981). "The World in Summary; Arms Negotiators in Geneva Begin To Chip the Ice". The New York Times. Retrieved 19 August 2016. ^ a b Wittner, Lawrence S. (1 April 2000). "Reagan and Nuclear Disarmament". Boston Review. Retrieved 17 August 2016. ^ "Nomination of William F. Burns To Be Director of the United States Arms Control and Disarmament Agency". Ronald Reagan Presidential Library. 7 January 1988. Retrieved 19 August 2016. ^ a b Bohlen et al. 2012, pp. 9–10. ^ a b Berger, Marilyn (21 October 2004). "Paul H. Nitze, Missile Treaty Negotiator and Cold War Strategist, Dies at 97". The New York Times. Retrieved 20 August 2016. ^ a b c d Nitze, Paul (20 October 1990). "Paul Nitze Interview" (Interview). Interviewed by Academy of Achievement. Washington, D.C. Archived from the original on 9 November 2016. Retrieved 20 August 2016. ^ Bohlen et al. 2012, p. 10. ^ Charles Moore, Margaret Thatcher: At Her Zenith (2016) 2: 23-26, 594-5. ^ Charles Moore, Margaret Thatcher: At Her Zenith (2016) 2: 590-96. ^ Carr, William (1991). A History of Germany: 1815–1990 (4th ed.). London, United Kingdom: Harold & Stoughton. p. 393. ^ CQ Press (2012). Guide to Congress. SAGE. pp. 252–53. ISBN 978-1-4522-3532-5. ^ "Senate Votes 93-5 to Approve Ratification of the INF Treaty", CQ Weekly Report 42#22 (1988): 1431–35. ^ "Intermediate-Range Nuclear Forces Treaty (INF Treaty)". U.S. Department of State. Retrieved 8 February 2019. ^ Trakimavicius, Lukas (15 May 2018). "Why Europe needs to support the US-Russia INF Treaty". EurActiv. Retrieved 18 May 2018. ^ "Intermediate-Range Nuclear Forces Treaty (INF Treaty)". U.S. Department of State. Retrieved 21 October 2018. ^ "Intermediate-Range Nuclear Forces Treaty (INF Treaty)". U.S. Department of State. Retrieved 2019-03-13. ^ "Putin rails against US foreign policy". Financial Times. 10 February 2007. Retrieved 8 February 2019. ^ Mark Stokes and Dan Blumenthal "Can a treaty contain China's missiles?" Washington Post, 2 January 2011. ^ "Россия «может выйти» из договора с США о ракетах". BBC. 15 February 2007. Archived from the original on 20 February 2012. ^ a b Gordon, Michael R. (14 February 2017). "Russia Deploys Missile, Violating Treaty and Challenging Trump". The New York Times. Retrieved 12 February 2018. ^ Marcus, Jonathan (30 January 2014). "US briefs Nato on Russian 'nuclear treaty breach'". BBC News. Retrieved 31 January 2014. ^ Luhn, Alec; Borger, Julian (29 July 2014). "Moscow may walk out of nuclear treaty after US accusations of breach". The Guardian. Retrieved 29 July 2014. ^ Woolf, Amy F. (27 January 2017). "Russian Compliance with the Intermediate Range Nuclear Forces (INF) Treaty: Background and Issues for Congress". Congressional Research Service (7–5700). ^ Rogin, Josh (7 December 2013). "US Reluctant to Disclose to All NATO Allies that Russia is Violating INF Treaty". The Atlantic Council. Retrieved 7 December 2013. ^ Kramer, Andrew E. "Russia Calls New U.S. Missile Defense System a 'Direct Threat'". NYT. NYT. ^ Kennedy, Kristian. "Destabilizing Missile Politics Return to Europe, Part II: For Russia, Pershing II Redux?". NAOC. ^ Gotev, Georgi. "Moscow: US comments on possible destruction of Russian warheads are dangerous". euractiv. euractiv. ^ Adomanis, Mark (31 July 2014). "Russian Nuclear Treaty Violation: The Basics". U.S. Naval Institute. Retrieved 31 July 2014. ^ "Russia may have violated the INF Treaty. Here's how the United States appears to have done the same". Bulletin of the Atomic Scientists. 2019-02-07. Retrieved 2019-02-08. ^ "США нарушали Договор по РСМД по четырем пунктам". Российская газета (in Russian). Retrieved 2019-02-09. ^ a b "U.S. to Tell Russia It Is Leaving Landmark I.N.F. Treaty". Retrieved 20 October 2018. ^ a b c "President Trump to pull US from Russia missile treaty". BBC. 20 October 2018. Retrieved 20 October 2018. ^ a b "Trump: U.S. to exit nuclear treaty, citing Russian violations". Reuters. Reuters. ^ "'Aggressors Will Be Annihilated, We Will Go to Heaven as Martyrs,' Putin Says". The Moscow Times. Russia. 19 October 2018. Retrieved 26 October 2018. ^ a b "Trump's missile treaty pullout could escalate tension with China". reuters. 23 October 2018. ^ Hellman, Gregory (23 October 2018). "Chinese missile buildup strained US-Russia arms pact". Politico.eu. Retrieved 23 October 2018. ^ a b Sanger, David E.; Broad, William J. (1 February 2019). "U.S. Suspends Nuclear Arms Control Treaty With Russia" – via NYTimes.com. ^ a b c d "Russia, U.S. Clash over INF arms treaty at United Nations". Reuters. 26 October 2018. ^ "Trump adviser says wants U.S.-Russia strategic talks on Chinese threat". Reuters. 26 October 2018. ^ "NATO's Stoltenberg calls on Russia to comply with INF nuclear treaty". Reuters. ^ "Putin Says Russia Will Retaliate if U.S. Quits INF Nuclear Missile Treaty". Retrieved 20 November 2018. ^ "U.S., NATO give Russia 60 days to comply with nuclear pact". NBC News. Retrieved 5 December 2018. ^ "Peresvet combat lasers enter duty with Russia's armed forces". TASS. Retrieved 7 December 2018. ^ a b c Balmforth & Osborn, Tom & andrew (23 January 2019). "Russia takes wraps off new missile to try to save U.S. nuclear pact". Reuters. Reuters. ^ Washington (earlier), Gabrielle Canon Ben Jacobs in; Holden, Emily (1 February 2019). "Trump picks climate change skeptic for EPA science board – latest news" – via www.theguardian.com. ^ Gabbatt, Vivian Ho Adam; York (earlier), Erin Durkin in New; Gabbatt, Adam (1 February 2019). "Roger Stone case: judge 'considering gag order' against Trump adviser – live" – via www.theguardian.com. ^ "Putin threatens new arms race after Trump pulls US out of nuclear weapons treaty". The Independent. 2 February 2019. ^ Maza, Cristina (2019-03-08). "Ukraine has the right to develop missiles now that Russia-U.S. nuclear treaty is canceled, Kiev says". Newsweek. Retrieved 2019-03-13. ^ a b Peterson, Nolan (2019-03-13). "Ukraine Considers New Missiles After Arms Control Treaty Collapses". The Daily Signal. Retrieved 2019-03-13. ^ "In Bipartisan Pleas, Experts Urge Trump to Save Nuclear Treaty With Russia". Retrieved 13 November 2018. ^ Ellyatt, Holly (22 October 2018). "Gorbachev says Trump's nuclear treaty withdrawal 'not the work of a great mind'". CNBC. ^ Swanson, Ian (27 October 2018). "Trump stokes debate about new Cold War arms race". The Hill. ^ CNN, Eliot Engel and Adam Smith. "US pulling out of the INF treaty rewards Putin, hurts NATO". CNN. ^ "NATO chief Stoltenberg bats for expanded INF treaty deal with more members | DW | 07.02.2019". DW.COM. Deutsche Welle. ^ Pavel Felgenhauer (9 February 2019). "Five years of free hands. What the termination of the Treaty on Medium and Short Range Missiles gives to Russia". Novaya Gazeta. ^ "Press Conference: Tulsi Introduces Legislation to Prevent Trump from Escalating Nuclear Arms Race". 15 February 2019 – via YouTube. ^ "Tulsi Gabbard presents bill to stop Trump from pulling out of INF treaty". RT International. ^ Blake, Andrew (15 February 2019). "Bill offered to keep U.S. in compliance with collapsing Cold War-era weapons treaty". The Washington Times. AP News. Retrieved 20 February 2019. Bohlen, Avis; Burns, William; Pifer, Steven; Woodworth, John (2012). The Treaty on Intermediate-Range Nuclear Forces: History and Lessons Learned (PDF) (Report). Washington, D.C.: Brookings Institution. Retrieved 16 August 2016. Davis E., Lynn (1988). "Lessons of the INF Treaty". Foreign Affairs. 66 (4): 720–734. doi:10.2307/20043479. ISSN 0015-7120. JSTOR 20043479. Garthoff, Raymond L. (1983). "The NATO Decision on Theater Nuclear Forces". Political Science Quarterly. 98 (2): 197–214. JSTOR 2149415. Giles, Keir; Monaghan, Andrew (2014). European Missile Defense and Russia. Carlisle Barracks, PA: United States Army War College Press. ISBN 978-1-58487-635-9. Haass, Richard (1988). Beyond the INF Treaty: Arms, Arms Control, and the Atlantic Alliance. Lanham, MD: University Press of America. ISBN 978-0-8191-6942-6. Legge, J. Michael (1983). Theater Nuclear Weapons and the NATO Strategy of Flexible Response (PDF) (Report). RAND Corporation. Retrieved 15 August 2016. Rhodes, Richard (2008). Arsenals of Folly: The Making of the Nuclear Arms Race. New York, NY: Vintage. ISBN 978-0-375-71394-1. Woolf, Amy F. (25 April 2018). Russian Compliance with the Intermediate Range Nuclear Forces (INF) Treaty: Background and Issues for Congress (PDF). Washington, DC: Congressional Research Service. Retrieved 9 May 2018. Wikimedia Commons has media related to Intermediate-Range Nuclear Forces Treaty.